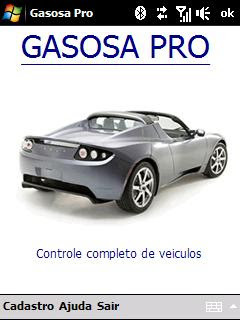 Gasosa Pro is a program to control and complete management of vehicles, with records of supply, average consumption expenditures, maintenance control, running paths, among other things... The program automatically sends an SMS alert to a phone set, when the time comes to do some maintenance and filter screen of supplies for those who use more than one vehicle. Multi Language: I am working on multi language option of Gas Pro, where there will be many files with the same words used in the program and the user can choose your language but need of volunteers who know other languages to do the initial translation of the words... (Details in http://tinyurl.com/2847jh7). For now Gas Pro is only in PORTUGUESE and SPANISH. If you know another language, know the reality turned to cars in this country (eg in other countries is not always used km / h or liters as standard), send me an email or leave a message here on the blog that will soon be available details and instructions on how to translate). English and German are the most wanted initially! If you like this project, please consider donate to the developer. Internal adjustments to the program works on devices with high resolution. Correção do bug de erro na tela inicial (__main_app_start) para alguns dispositivos. The bug fix error in the initial screen (__main_app_start) for some devices. Correção de bug na parte de acionamento e desligamento da rotina interna de GPS. Bug fix on the drive and shutdown routine internal GPS. Reajustado layout da tela de veiculos para facilitar a digitação. Reset the screen layout of vehicles for easy typing. Acrescentado a opção do idioma ESPANHOL. Added the option of the Spanish language. Agradecimentos a Alejandro Cisternas. Thanks to Alejandro Cisternas.